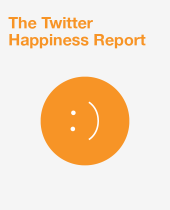 For our latest report, we analyzed over 1m tweets to find out who's happiest on Twitter. One of the most clichéd introspective questions: If you were granted a sum of money and a finite number of days to live, how would you allocate those resources? Now, I want you to save the eye rolls and look around the office. How do you think your friends and coworkers would spend that time and money? Furthermore, what would be the motivating factors driving those decisions? According to a Harris Interactive study, your answer may depend on your age. Indeed, today’s millennials are much more focused on happiness. More specifically, they want meaning – a connection to something greater than themselves. This generational shift in focus has massive and important implications for cultural and social changes. Still, those maintaining an older disposition might ask, so what? How will this affect businesses? Return to the initial question. Millennials will invest their time, money and effort into the places, people, jobs and lifestyles that nurture happiness and meaning – much more so than their past generation. With that in mind, it’s not difficult to assume that promoting happiness and meaning will attract investment from millennials and potentially be a driving factor in many organizations’ success. So because it seemed interesting, risky and potentially valuable, we endeavored to gain some insight on how happiness plays out on Twitter. We listened to over a million Tweets as users ranted about their best days, worst days and how much they hated or loved their lives. We listened, not because nobody else would, but because we thought there might be something new to learn about happiness. The ratio of positive to negative Tweets reveals a geography of people’s mood online. Perhaps unsurprisingly (think of the weather, for one), the West and South reported more positively about their days than the Northeast or Midwest did. Interestingly, comparing the conversations of 30 major cities to their respective states, the cities were actually more positive 80% of the time, suggesting that for most Twitter users, city life is best. Furthermore, using Brandwatch’s Rules and Categories, we were able to separate conversations into three topics: Friends & Family, Money and Work. The figure below shows how positive people were online when discussing the quality of their day as well as the quality of their life in regards to these three topics. Yes, Friends & Family is the most positive topic of the three. It is heartwarming to see that but it’s also largely unsurprising. What is interesting is the difference between positivity when people are using day terms (“Today was awesome”) versus life terms (“Life is great!”). With day terms, Friends & Family is nearly equivalent with Money. In life terms, Friends & Family maintains a clear dominance. This finding suggests that while Money is a strong source of happiness in the short term, Friends & Family are a better source of long term happiness. Want to see what else we found out in our research?